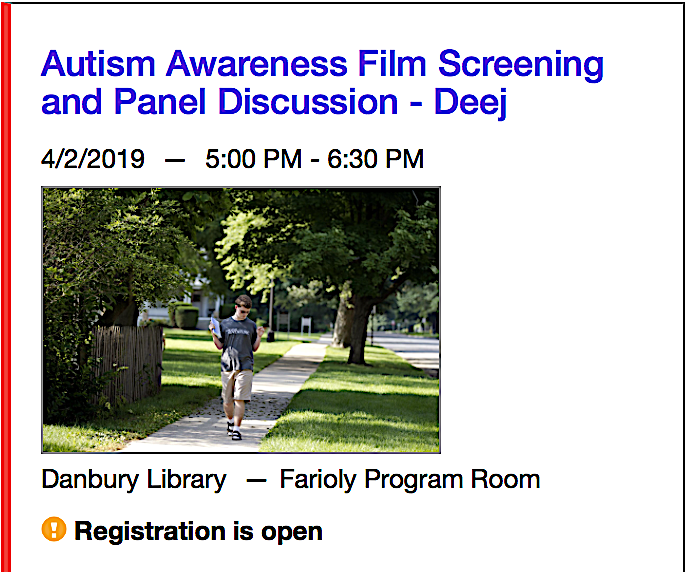 A screenshot of the event listing on the Danbury Library website. The film chronicles six years in the life of DJ Savarese, who seeks to help less fortunate kids by “showing people what a nonspeaking student with autism can do.” The screening is recommended for those ages 15 and up, educators, service providers, and parents of special needs children. 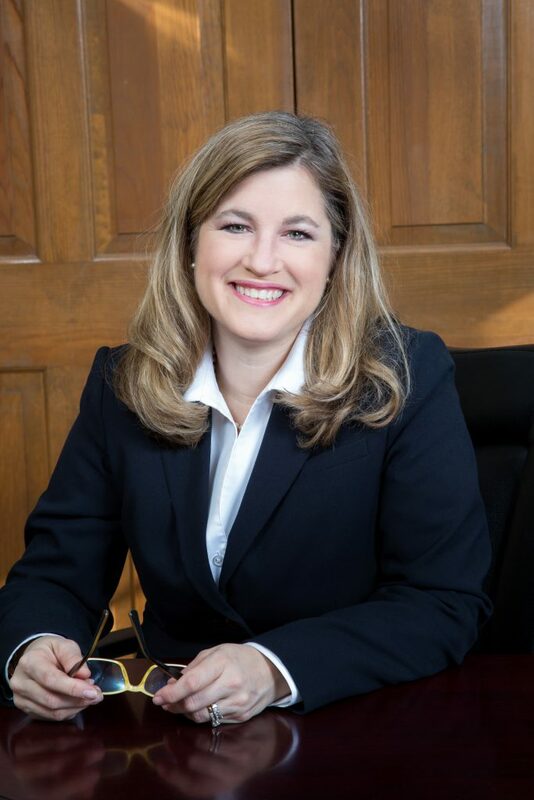 The panel discussion is being presented in partnership with WeCAHR (Western Connecticut Association for Human Rights), whose executive director, Christina Calabro, asked Attorney Collins to participate. Attorney Collins anticipates getting questions from those who attend the film screening about expression techniques for those dealing with autism, such as music, and the use of technology like iPads. “For the third consecutive year, on Tuesday, April 2, Danbury will join the Autism Awareness Movement as families of loved ones on the spectrum, community agencies, activists, the City of Danbury, Danbury Public Library, and David Parks, owner of Spin Doctor Entertainment, will come together to light up our public library blue for autism, and host awareness focused events for all ages throughout the day,” explains a news release posted online at Danbury’s HamletHub. Those planning to attend can register for events at ww.danburylibrary.org. “Light It Up Blue” day has been held at city hall, and is being hosted this year at the library to highlight a fundraising campaign to help the Friends of the Danbury Library Inc. furnish a new sensory room in the library’s children’s department with objects and activities designed to stimulate children with special needs, the release explained, noting the room will be the first of its kind in a library in Connecticut. “With the addition of a sensory room, the library will be a model for all public places in creating a supportive environment for the sensory sensitive population and promoting inclusivity,” library director Katie Pearson said in the news release posted by Tara Carvalho and event organizer Emanuela Palmares. 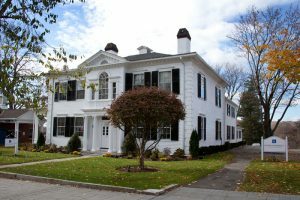 A Partner in Cramer & Anderson’s Danbury office, Attorney Collins has strong record of achieving meaningful outcomes for clients in Personal Injury Law, Social Security Disability and Workers’ Compensation cases, and a continuing legacy of service, often focused on advocacy and mentoring for constituencies in need of understanding and assistance. She can be reached by email at jcollins@crameranderson.com and by phone at (203) 744-1234.